When replacing a switch in in an existing 3-way circuit, you must replace it with another 3-way switch or the circuit will not function correctly. This article and detailed wiring diagram demonstrates the steps to replacing the switch in the 3-way circuit. Q: In the process of remodelling our kitchen, we have disconnected one of the switches from our three way switch to our ceiling lights! We are now told by our “electrician ?? ?” that we need to replace the old switch with a three way switch instead of a one way switch. Duh! Even though I’m obviously ignorant of these matters, it seems to me that this is sheer nonsense! Doesn’t a three way switch simply interrupt the “hot” wire? In that case, why do we need to replace the old three way switch with another one instead of simply replacing it with a single switch?? Please send info how to accomplish this! Your help would be greatly appreciated! A: Your “electrician” is correct. You could use a single pole switch, but the circuit will not work as designed. 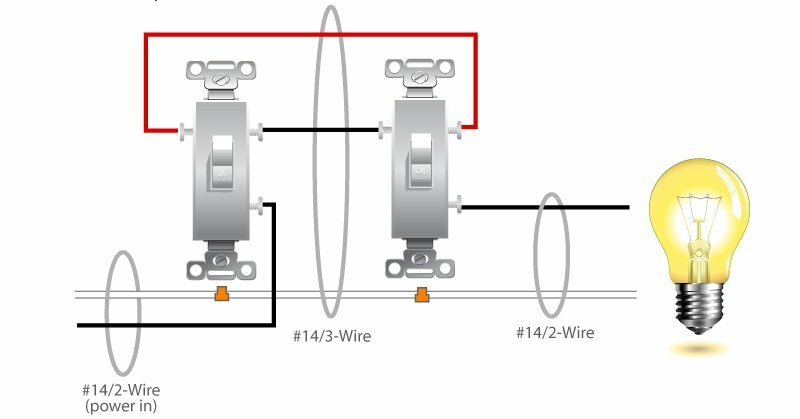 Here is a diagram of a simple 3-way switch network that should illustrate why. You must replace a 3-way with a 3-way, and pay attention as to which wire was connected to the identified ‘common’ terminal. This entry was posted in Indoor Wiring and tagged 3-way, 3-way switch, 3way, circuit, common terminal, home electrical wiring diagram, house wiring diagram, how to wire a 3-way switch, lights, replacing a switch, single pole, single pole switch, switch, terminal, three way switch, wiring diagram. Bookmark the permalink.